A few minutes into The Headless Woman, Veronica (Maria Onetto)—the titular headless woman—hits something with her car as she searches for her ringing cell phone. From a rear view, we see, in a briefly held long shot, what appears to be a dead dog in the middle of the road; she drives on. Soon, it becomes clear that the accident has affected Vero’s mental state. She is confused and disoriented. Over time, she starts to return to normal. But as Vero pieces things together, we are left doubting what we’ve seen. Vero realizes she may—or may not—have killed a child with that thud, and we start to wonder if we can really trust that shot of the dog, or even if it was a dog we were looking at in the first place. As a mystery, The Headless Woman may not resolve itself to most people’s satisfaction, but as the film progresses, it becomes increasingly clear that what occurred is less important than how Vero and her family choose to deal with it. Throughout, Martel’s camera captures two different kinds of people occupying spaces: the bourgeois extended family to which Vero belongs and the servants and workers who constantly surround them. These people circle each other—they even interact—but they seem to live in two different worlds. The boy, who may or may not be the victim of Vero’s negligence, belongs to that second class, and so, one might say that whatever happened in the actual accident, The Headless Woman traces the consequence of a collision between two sets of people who occupy the same space but live separately. After her accident, Vero tries to learn what happened and to determine her level of culpability. Yet little by little, the evidence vanishes, and her interest recedes. Vero has the opportunity to retreat into bourgeois complacency. Though her central character is content to forget whatever actually took place, Martel demands more from us—an active engagement with memory and perception. She also puts faith in her audience, that we will struggle with her strikingly lovely but frustratingly ambiguous film, and that we will let it sit with us and coalesce into something quietly but undeniably devastating. Reverse Shot had the opportunity to sit down with Martel to discuss swimming pools, David Lynch, alien invasions, and The Headless Woman. Reverse Shot: Where did you get the idea for the film? 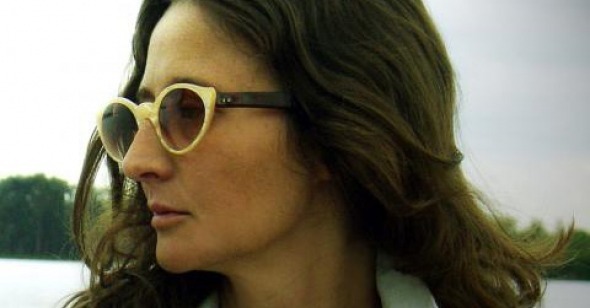 Lucrecia Martel: I collect notes on things that interest me: sometimes—but not very often— images, but mostly sound, dialogue, characters, and some very abstract ideas, too. Then I have a book of notes. Sometimes, I find a plot or storyline that helps me to put these things together, and I realize that I am working on something that I want to share with an audience—or someone—about the perception of things and situations. For me, the way we define moral issues is linked to emotion and perception. Then I begin to develop the script in layers. There are a number of things that for me are connected, and I need to work them into each scene. I have done the same kind of work on all three films. RS: One of the layers that seems to be present in all of your movies is the issue of class, and I think here, you have moved it to the foreground. LM: Because it was interesting to show without pointing to it or underlining it. The mise-en-scène, the movement of the characters, and the use of focus—what was in focus and what was not—allowed me to make a very clear reference to it. RS: Vero goes through the film confused, and we share her confusion. Sometimes we see things that she does not see, and other times, she see things that we don’t. For example, when they go driving at night, her husband talks about seeing the dog, but we never see it. How did you decide when to show us more and when to obscure what we see? LM: For me it’s very clear. Most of the time, I trust what the characters are saying. So if they say they see a dog, I believe there is a dog. If you show everything, you underestimate the audience. It is important to blur the line between what is real and what is not and to get people to think about reality and perception. If you show everything, you make this path very clear and precise, and it doesn’t help the film. RS: The sound ends up filling in the spaces we don’t see. How do you create the sonic environments of your movies? LM: From the very beginning, even when I’m writing, I think a lot about the sound. Many elements of my work in cinema come from oral storytelling and oral tradition. I think about sound and the rhythm of the sound. It makes it easier to shoot the scene, because you know exactly what you’re supposed to hear, and whether there’s some sound in the scene. When you have that clear, you don’t need too much narrative material. RS: Your framing is unconventional, but it feels very deliberate. Do you do a lot of planning before you shoot? LM: This is precisely a consequence of thinking about sound first. When I get onset, I just need to find a good place to shoot most of the scene. I make the decision about where to put the camera and how to frame in the moment. I don’t think about that in advance. RS: Your style has been called oblique or minimalist, and I wonder how that evolved. LM: Most of the ideas about using offscreen space came from when I was a teenager and used to shoot my family with a video camera. You can learn very quickly from ignorance, and you can try things without paying attention to movies. RS: I want to return a bit to mise-en-scène. Vero's hair is so striking. It seems simple, but it says so much about her character and also about the issue of class. LM: Yes. And there is a kind of play with Kim Novak. I love Vertigo. But The Headless Woman is not an homage—not as a whole. In this point, though, it was fine for me to make the reference. RS: Another element of mise-en-scène that seems important in each of your films is the swimming pool. LM: I don’t like swimming pools, because I have the feeling that they are always dirty, like an infection. At the same time, in Argentina, there are not many public swimming pools, so I think that the idea of having a cube of water just for a few people is like having a slave—to think that all of this water belongs to you as your property. I like to shoot in swimming pools, though, because it’s like a room, below the level of the ground, full of water. There are many similarities between the behavior of a body inside a swimming pool and out of the pool. Both are in an elastic space. It’s fluid. The sound outside and the waves inside the pool both touch you in the same way. I think there are a lot of similarities in perception—between being in a pool and being in the world. RS: The Headless Woman is built around an incredible performance. How did you work with Maria Onetto? LM: When Maria and I were talking about the character, we tried to avoid the idea of amnesia. Because it’s not about amnesia. It’s about when you lose the link between things, and the link between a thing and what it means to you. It’s more of a shock. You know it’s a table, but you’re not sure what the table is for. I know that I know you, and I know that you’re a part of my family, but I don’t know if I hate you or love you. I also didn’t want to link her with the idea of guilt. It doesn’t work. It’s useless to think deeply about perception and human beings and then to think about being guilty or not guilty. If you use the word “guilt,” you’re saying there is something precise, that there is a reality, and I’m not sure about that. The Headless Woman is not about a woman who feels guilty; it’s about a woman whose worlds are nearing collapse. RS: We become less certain about everything as we move along. We don’t know what she knows or what she thinks or if we can trust what she saw. LM: Well, you can have doubts about whether she kills someone or not. But the film is very clear with how she decides to deal with this possibility, and how the family and social class decide to react to the situation. There is a beautiful and at the same time horrifying mechanism in society: if you want to protect someone, you can disown his or her responsibility across his or her class. This sounds really beautiful, but it only works for some layers of society. The film reveals a blurred moment of a woman’s life, and shows how things become more secure by making certain things disappear. Like my other films, The Headless Woman doesn’t end in the moment that the lights go up, it ends one or two days later. That’s why I don’t like to do [post-screening] Q&As. LM: Yes, all of the films are more or less memories. You know, family is like a swimming pool too. If you want to understand things that you see in the spread of social life, if you focus on the family, you can see it immediately. And the desire amongst family members, it’s closely linked to the gap between classes and to the social tendency to want a social class closed, like a caste, while the gap between classes gets bigger. RS: You’ve been described by some critics as belonging to a “New Argentine Cinema” movement. Do you consider yourself to be a part of a movement? LM: I’m an “Argentinean director.” But I think that the word “movement” implies that you engage in conversations about philosophy, aesthetics, and politics. That doesn’t really happen with us. I know most but not all of them. Some of them I only have contact with every two or three years. We are not friends. So there is no movement or wave. But what you can see in Argentina is a group of directors who belong to the same generation, and there was a gap during the dictatorship. There were students of cinema who disappeared, and then we appeared. So it looks like a movement, but it’s really just shared experience. We have have history in common. For certain, I feel like I’m a part of Argentine cinema. It’s impossible to avoid. RS: Do you think about history when you’re making a movie? LM: The generation that was around in the 1970s was really involved in politics. They had a strong sense that their actions could change the world. After the dictatorship and the 1980s, there was this horrible individualism in our culture. It was exactly the opposite of this notion that you are an actor in the history of your culture and your time. In a way, for me, to make cinema is very public. It is like a public speech. It is my way of belonging to history. I found in cinema a kind of happiness, a way to fulfill my life as an actor in this history. RS: I’ve read reports of your next project being an alien invasion picture. LM: I’m working on an adaptation of a comic book from the 1950s, very famous and very popular. A producer offered the movie to me, and at first I thought, “No,” but then I had an idea. Now I’m working on it. There was a period in which the Cold War was very present, even in comic books. Now we don’t have the same fears. In America, it’s different, but in South America, we don’t have an enemy now. In the 1960s and 1970s, the fear was that the U.S. would invade us, and in a way, the economy became this invasion. Today, it’s as though the invasion took place, and there is no enemy. The idea of the enemy doesn’t work anymore for us. So I am trying to process our fears today—what our nightmares are. It’s an interesting process, and it involves observation of everyday life. I can’t stop, because when something gets me, it’s impossible to let it go until the movie’s done. I make the movie, and then I'm free. RS: Do you expect it to be a big change for you? LM: In a way, yes, but it’s also like going back to my hometown. I love the genre of horror films, from my childhood, even. RS: And The Headless Woman, in a strange way, is a horror film. LM: I always work with some elements of horror. I love the dissolution of reality in horror films. The lack of certainty, and the lack of security. What are you seeing? What are you hearing? RS: In Cannes, the response to the movie was mixed, but here it seems quite enthusiastic. Do you feel a difference? LM: Cannes is a bad place to see a movie. Busy festivals are bad places to see movies. Some movies are at a disadvantage in those environments. I always trust in time—that people reflect and see films in other ways. With commercial films, if you don’t like the film, at least you have something to take away, but with this kind of film, there is no middle. RS: It requires contemplation and reflection. LM: If you want movies to give you everything, this movie fails. You have to be there. I need you. I don’t want to show you. I want to really share something. It’s not easy. When you have a conversation, and you really want to understand the other person, it takes time and effort. It's the same with this movie. RS: As a result, your films are unique. I can’t think of another filmmaker who makes movies like yours. Which makes me wonder: Are there other filmmakers you’ve drawn inspiration from? LM: I am not a cinephile. But I like many kinds of cinema from John Woo to Ingmar Bergman to Cronenberg to John Huston to Apichatpong to David Lynch. And, of course, Almodóvar, but that’s like my own family. RS: It’s funny that you mention Apichatpong and Lynch, because like them, your movies require the audience to engage. LM: Lynch and Apichatpong oblige you to lose your mind.